By Jennifer Lentfer, Thousand Currents Director of Communications. This post also appeared on Medium. 1) We invest in long-term partnerships. Most funders give money in one- to three-year project cycles. Thousand Currents invests in our grassroots partners for as long as it takes. Why? Social and systemic injustice has deep roots. Social transformation doesn’t happen overnight. We define the time frame of our partnerships not by months or years, but by outcomes. And those outcomes are co-created with our partners. Currently, our senior partnerships have extended beyond 15 years. Because partnership entails a significant commitment, we choose partners carefully, with confidence that the partner organization operates in an accountable, democratic, and transparent way in working towards lasting social change for marginalized communities. 2) We provide general operating support, respecting local expertise. Because of the due diligence we do before committing to our partners, and because of our strong and continuous communication and trust-building with them, and because of our shared values with partners, we give grants with no strings or conditions attached. That means we don’t dictate what activities and strategies they use, freeing them up to listen more closely to the community. If our partners want to pay the light bill, or start a new program, it’s up to them. We, in San Francisco, New York, and Washington, DC, are not in the best position to understand or address those social, political, and economic problems, with deep roots. The people who can solve them best are the people whose lives are most affected by them. We believe in this approach so much that we ask our funders to do the same. 3) Our Global South partners shape our strategies. Thousand Currents’ Theory of Change was not developed internally within the staff team, and then shared with our partners for input. Instead, the process involved our partners as co-creators, protagonists who designed a non-linear, complex, and iterative tool that now many other organizations adapt and use. 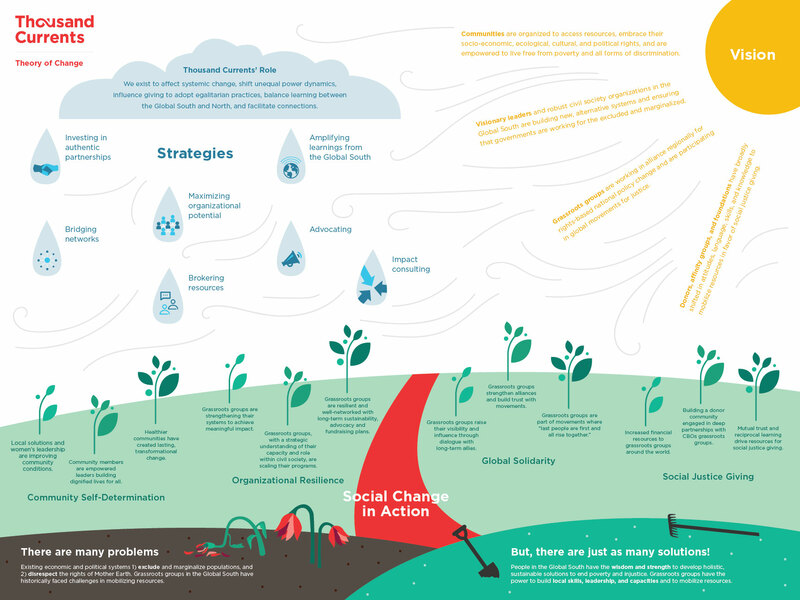 We added organizational resilience and global solidarity components to our theory of change as a direct response to partners who wanted us to step it up in those areas. Then, perhaps more importantly, partners offer challenging feedback to Thousand Currents that requires strategy shifts. 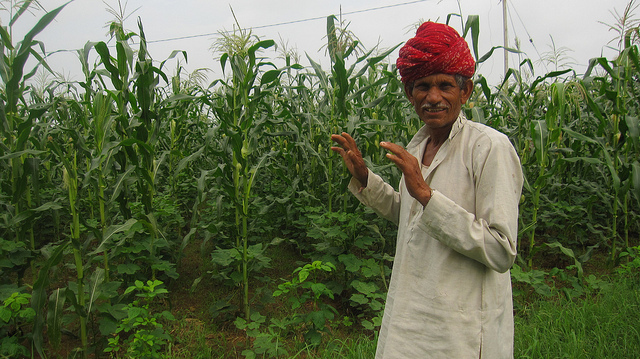 For example, one of the key learnings that emerged from Thousand Currents’ 2012 Learning and Evaluation Report was that Thousand Currents’ global partners wanted Thousand Currents to become a more visible advocate for its partnership model and to build the capacity of other funders to understand why and how it is practiced. The Thousand Currents Academy is a response to this mandate from our partners. 4) We stick with our partners as they change. 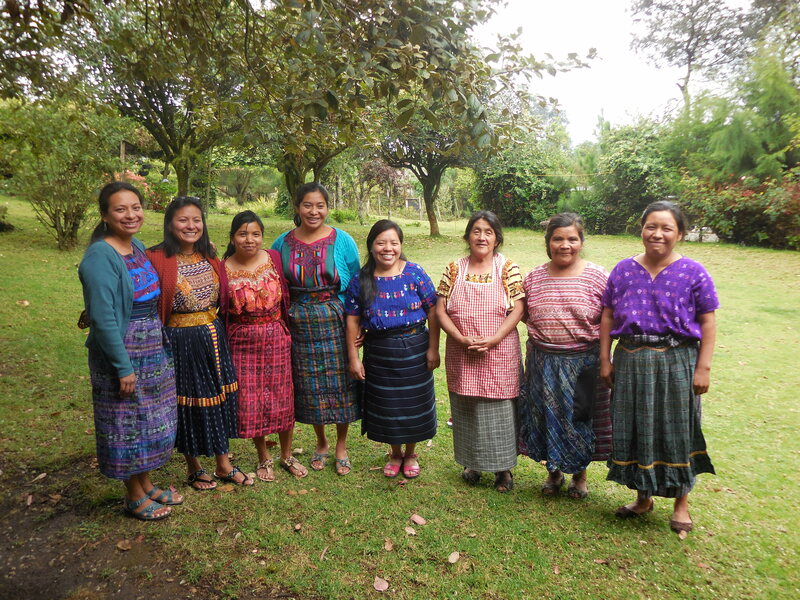 AFEDES changed organizational strategy completely from income-generating activities to gender-based violence prevention and women’s rights, based on what they saw as the most pressing root causes of the problems they were trying to address. Other donors could have bailed based on such a shift. But Thousand Currents doesn’t bail, even when partners are “at the end of our rope.” This is what it means to be in partnership over the long-term and with community self-determination at the center. 5) We do more than just provide funding. We wade through rivers (yes, plural!) to visit our partners. We march with them in protests. 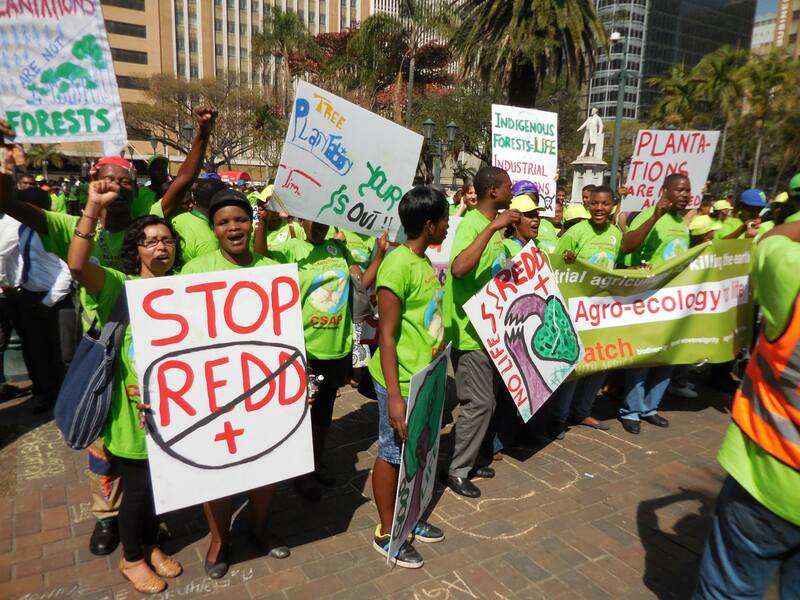 Yeshica Weerasekera (left) marches with Thousand Currents partners in the “Real Forest Rally” in Durban, South Africa during the U.N.’s World Forestry Congress 2015. When South Durban Environmental Community Alliance Director Desmond D’Sa came to the U.S. to accept his Goldman Environmental Prize, Thousand Currents staff obtained a meeting for D’Sa with the Japanese foreign aid donor that was funding part of the expansion of the Durban port, which D’Sa’s group is fighting against. Active solidarity does not just mean reading proposals and writing checks. Having an intentional strategy for alliance building, to build global solidarity, is powerful and required for lasting transformational change. 6) Thousand Currents asks its partners to evaluate us. How does Thousand Currents perform as a funder? Many donors have rigorous models of measuring programs implemented by their partners, but offer few opportunities for that evaluation to also flow the other way. Thousand Currents’ 2012 evaluation of our partnership model was based on surveys and interviews with Thousand Currents grantees. Oh, and we also conducted similar exercises in 2011 and 2003. 7) We learn with our partners, through thick and thin. Deep dialogue is at the core of learning together. 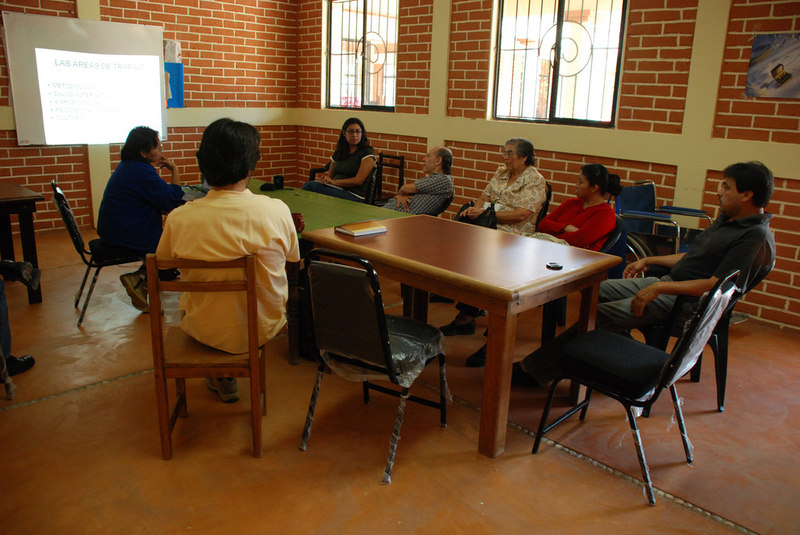 Thousand Currents staff have learned the concept of buen vivir and adapted the practice of coyuntura, from one of our partners in Latin America, a process of collective contextual analysis to help us learn current conditions and adapt our strategies to the realities on the ground. “They’ve influenced our thinking based on their fresh approach to grantmaker/grantee relationships, and I’ve since raised these issues at donor forums. I remember them asking a number of questions that provoked my thinking,” says another grantee. Thousand Currents cares to know who our partners are as people, their dreams, their aspirations, their plans. 8) Thousand Currents staff focus on developing their own skills. To engage in deep listening and dialogue with our partners, Thousand Currents places a lot of emphasis on cultural competency and professional/personal development for staff. Thousand Currents currently has an artists-in-residence program and “drives with Mutombo,” an opportunity for staff to engage deeply one-on-one with a Thousand Currents “elder” and mentor, Dr. Mutombo Mpanya of Sonoma State University and the California Institute of Integral Studies. These efforts pay out. One hundred percent of survey respondents to our grantee evaluation report (of Thousand Currents) from 2012 indicate that in their experience, Thousand Currents staff are respectful all of the time, and are transparent. “They showed a lot of respect. We blended. We sang the same songs, we ate the same food,” one partner described. 9) Thousand Currents partners speak for themselves. We don’t go to international conferences without our grantees. We give our communications platforms over to our partners to share their work and give voice to their concerns, like how ASHA Nepal used a special fund to respond to the earthquake, why BioWatch went to Parliament, and for DESMI to explain what they mean by the “solidarity economy.” They share in English and Spanish and more languages if necessary. We also speak out when people are not portrayed with dignity by NGOs or do not own up to their mistakes. So does Thousand Currents walk the talk? Perhaps the holiday greetings we received yesterday from a partner in Guatemala says it best. “Thank you to the whole team of [Thousand Currents]. We also wish you all much happiness and the best wishes for 2016. *Thousand Currents changed its name from IDEX in 2016. What were you doing when you were 30 years old?